Notre première édition de la visite santé au supermarché IGA Lipari fut un grand succès, nous remercions tous les participants qui se sont joint à nous! 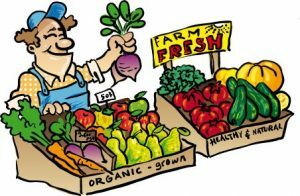 Notre nutritionniste du GMF Sante Kildare Caryn a su nous guider à choisir sainement et à comprendre le fonctionnement des coulisses alimentaires. La lecture des emballages et les choix à privilégier n’ont plus de secrets suite à cette visite interactive et dynamique. Nous planifions offrir plusieurs présentations sur la promotion de la santé dans les prochain mois, restez aux aguets! Au programme : nutrition chez les personnes âgées, diabète, soutien aux aidants naturels et plus encore! Un article intéressant paru dans LaPresse+ le 17 mars 2017 discutant l’importance du sommeil tant chez les enfants au primaire que ceux au secondaire. 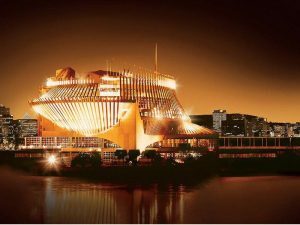 No need to worry…Casino Montreal still has unlimited free parking! 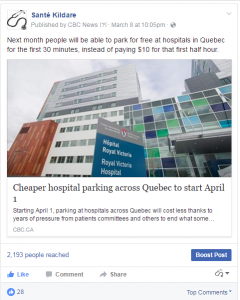 Our Facebook post last week on plans to reduce parking fees at Quebec hospitals was our most popular yet. Parking fees can be excessive and their appropriateness has been extensively debated. 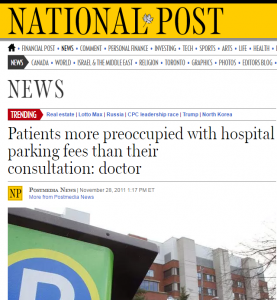 In the March 6, 2012 issue of the Canadian Medical Journal (CMAJ), doctors debated the merit and necessity of charging patients for parking. Dr. Tom Closson, President and CEO of the Ontario Hospital Association, argued that parking fees are one of the most common ways of making up the deficit of hospital operating budgets. He stresses that provincial government cutbacks to hospitals eliminate “crucial revenues that hospitals use to fund clinical research and front-line patient care.” He admonishes the Journal’s editorial board, “surely CMAJ has something to say about these and other more relevant issues, instead of banging away on the populist drum about parking fees. • Hospital visitors will be able to park for free at hospitals in Quebec for the first 30 minutes, instead of paying as much as $10 for that first half hour. • A flat daily rate will not be applied until a vehicle has been parked for more than four hours, a big change from the current practice of charging the maximum daily rate after 90 minutes. • Health care institutions must offer weekly and monthly parking passes, as well as books of tickets, at reduced rates. • Health care institutions must offer daily parking passes that allow motorists to come and go without penalty. MEDICAL DONATIONS: HOW CAN WE HELP AND WHAT ARE THE DRAWBACKS? A nice story in the Gazette this week about sharing used medical equipment in Third World countries. 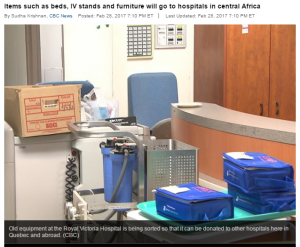 Furniture, bedside tables, equipment from the old Royal Victoria Hospital will be sent to Central Africa to be used in eight hospitals in Cameroon. In Canada, HOPE and HPIC are two organizations that help with this cause. HPIC (Health Partners International of Canada) is a relief and development organization dedicated to increasing access to medicine and improving health in the developing world. HPIC is an independent charity that receives donations of medicines, vaccines and medical supplies from Canadian pharmaceutical and healthcare products companies, to be used for humanitarian purposes. HPIC is funded in part by the Government of Canada, foundations, companies and individuals. Since 2012, Santé Kildare has sent supplies to JustWorld International to support the medical clinic located in Jocotenango, Guatemala. 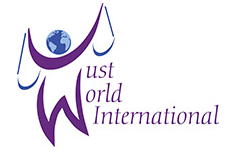 Promoted through the international equestrian community, JustWorld supports basic education, nutrition, health & hygiene, and cultural development programs for children in impoverished communities in Cambodia, Guatemala, and Honduras. 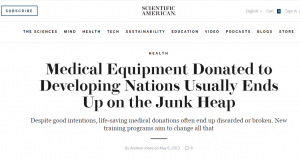 Regrettably, medical equipment donated to developing nations is not always used. 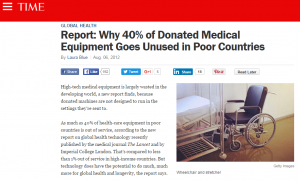 While medical equipment donations in theory enable hospitals in developing countries to receive expensive and advanced technology, in reality much of the equipment breaks easily and is not repaired. A study of seven hospitals in Haiti found that only 1/3 of the 115 pieces of medical equipment donated after the 2010 earthquake was working after 3 years and 1/2 of the broken equipment could not be repaired. Some of the donated devices, such as incubators for premature babies, were never used because of insufficient electrical voltage in Haiti. The World Health Organization (WHO) estimates that only 10-30% of all medical equipment donations are ever put into operation. Not only does the equipment need to be donated, it needs to be shipped, delivered, installed, and the local staff trained.